When hunger strikes, be it at meal time or late-night, it’s a minute too late to plan a healthy meal. Once you’re hungry, it’s hard to make healthy decisions, especially if they take time to prepare. For all the complicated diets out there, this one is really simple, and only relies on one ingredient. Apples. Anytime I want something I shouldn’t eat, or it’s a time of day I shouldn’t eat (such as late at night), I eat an apple. In my opinion, the goodness apples offer outweighs the nutritional intake, so they don’t count toward my daily calories. In researching for this blog, I actually found studies proving that the 60 calories from the apple can actually save you about 180 calories in bad decisions, such as what you’ll consume at a meal post-apple. I’m hungry, chips are handy, but I know I should make a salad or an omelette. I eat an apple while I make the healthy option. I get done working out, am suddenly famished, but don’t want to undo the good I just did by stuffing my face or pulling through somewhere for a fast snack. I eat an apple. It’s 9:30p, I’m watching “Game of Thrones,” and somehow I get the munchies even though someone just lost his head. I eat an apple. Apples are sweet enough to parlay a candy craving, and the fiber and water content help fill you up. I always tell myself, if I still want what I was originally craving, I can have it after the apple. Thanks to the apple, the craving either goes away, or I indulge in less of it because I’m already more full from having the apple. It’s my version of the apple-a-day concept. Need help finding the right apple? I choose my apples by smell. I stand in the produce aisle sniffing each apple until I land on the one that makes me want to take a bite. This trick will not work with applesauce or apple juice. Go for the whole apple, skin and all. Plan to have a washed apple ready to eat in your car, purse, desk, gym bag… anywhere. If you have a bottle of water and an apple with you at all times, you will be setup for success. Some studies have even shown apples to be fat blockers. I hope this trick helps you the way it helps me. 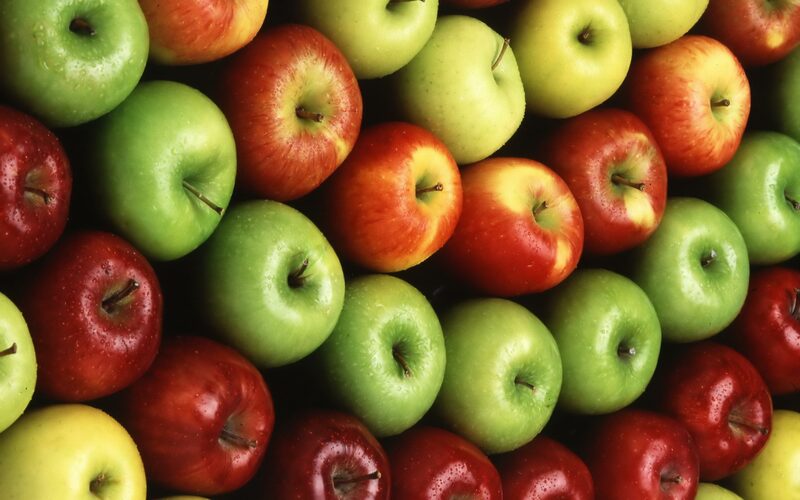 Apples are an easy, inexpensive way to make a good decision each day. Let that good decision lead to more!